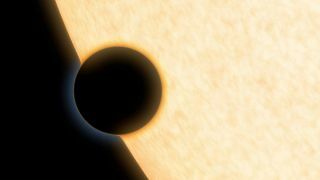 An artist's impression of the Neptune-size planet HAT-P-11b as it crosses in front of its star. Astronomers found water in the atmosphere of the exoplanet. Similar studies may reveal oxygen in the air of other worlds. Although scientists have long considered oxygen a sign that life exists on an alien planet, new research suggests the element could be produced without it. Oxygen may function as a sign of life on Earth, but that's not necessarily the case for planets around other stars. The new research shows that the interaction of titanium oxide with water could produce oxygen in the atmosphere of an exoplanet without the involvement of living organisms. In recent years, scientists have begun using instruments such as NASA's Hubble Space Telescope to investigate the atmosphere of planets beyond the solar system. The upcoming launch of the James Webb Space Telescope will enable even further study of these worlds. In addition to characterizing the air on these worlds, scientists also hope to one day find evidence of life. On Earth, plants release oxygen into the air through photosynthesis. If a planet beyond the solar system was found to contain oxygen in its atmosphere, scientists reasoned, that oxygen would have formed as a byproduct of life. Narita and his team decided to study the role of stellar radiation around stars similar to the sun. They found that, if enough of the mineral titania lay on the surface of a planet, it could dissolve in liquid water, producing oxygen in the atmosphere. Titania is a naturally occurring substance present in meteorites and on Earth's moon. It forms as dust outflows around evolving low- and medium-mass stars, and through supernovae, and is thought to be common in exoplanet systems. The amount of titania on the surface of a planet or moon would vary based on the number of impacts each body received. According to the research, an Earth-like planet orbiting a sunlike star would need only enough titania to cover about 0.05 percent of the planet's surface to create the same amount of oxygen as in Earth's atmosphere. Planets that had oceans and orbited dimmer stars would need to have only about 3 percent of the surface covered with titania for similar results. For comparison, the researchers estimated that the area with active titania on the surface of the Earth is much less than 97 square miles (250 square kilometers), or about 0.0000005 percent of the surface. The research was published online in September in the journal Scientific Reports.